I’m a massive fan of frozen bananas. No matter how weird it sounds, don’t judge before you try. Stick a banana in the freezer for a few hours, and it is transformed into a popsicle – but healthier. Perfect on really hot days, and even better when smothered in peanut butter. This recipe allows you to get a little fancy with the frozen banana concept. I opted to mix up the filling suggested in this recipe, using an amazing hazelnut butter I found in my local supermarket in Istanbul instead of peanut butter. You could use Nutella too, if the mood takes you. Lay out a sheet of greaseproof paper on a baking tray. 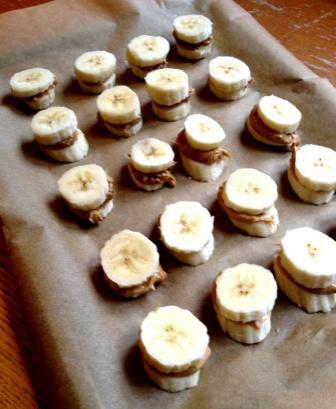 Peel and slice the bananas into rounds about a centimetre thick, and lay them out on the baking tray. 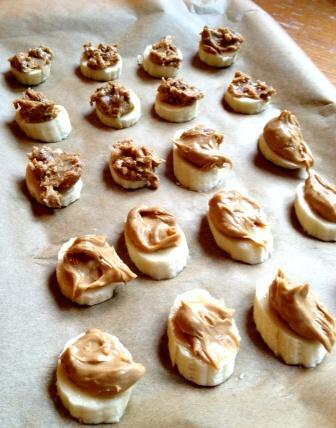 Spoon the hazelnut butter onto the banana halves, then top with another slice of banana. Don’t worry about making a mess, and be generous with that butter. Put the banana and hazelnut butter slices into the freezer, and leave to chill for at least an hour, or until the banana slices are frozen. Next melt the chocolate. Break into pieces and place in a heat-proof bowl over a pan of boiling water, making sure not to let the water touch the bowl. When the chocolate is melted and looking glossy, take the banana slices from the freezer and dip them one by one into the chocolate, until they’re completely coated. 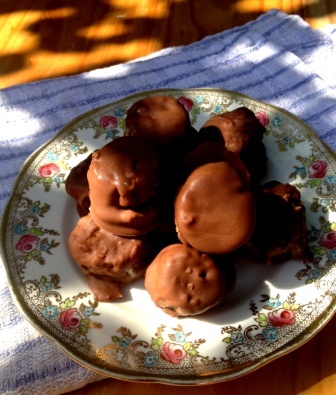 Put the chocolate-coated banana slices back into the freezer until the chocolate has set completely. You can enjoy these direct from the freezer, or keep them in the fridge. Use two forks to roll the bananas through the melted chocolate – and watch your fingers! That stuff is really hot. Don’t let the chocolate cool too much while you coat the bananas. If you let it cool and re-heat it, the chocolate will emulsify and go thick and grainy. You might even need to melt the chocolate in batches, so that it won’t set as you work. Keep a spatula on hand to scrape up any wayward chocolate as you go.